Philadelphia Stories is not just hosting a benefit to support the free magazine by local writers on April 19, 5-8, at the Center for Architecture. We are throwing a PARTY. Here are five reasons why you do not want to miss the fun. INDULGENCE: Enjoy delicious hors d’oeuvres, local craft beer from Dock Street Brewing Company, and the thrill of a live auction. Meet new friends who share your passion for writing, art, and local culture. 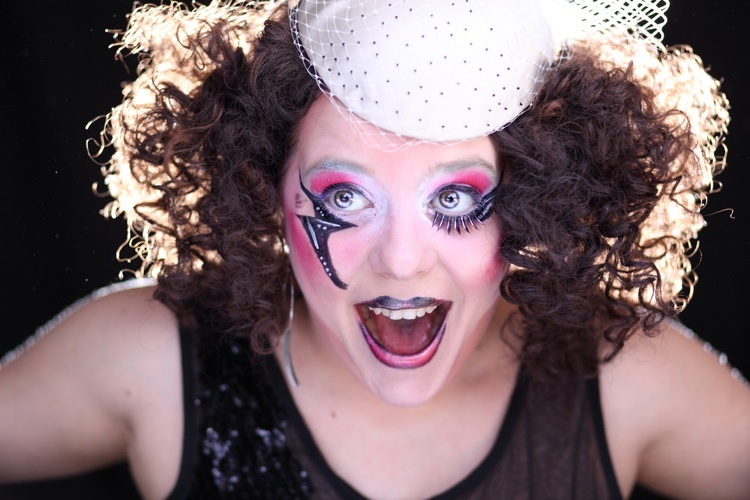 GLAM: BRAT Productions will perform Eternal Glamnation, which blends live music and theatrical spectacle in a night of big vocals, secret selves, and glitter. POETRY: Yes, poetry rocks, too. Be surprised by the diverse rhythmic stylings of poetry from the Sandy Crimmins Poetry Contest winners and Philadelphia’s first Youth Poet Laureates. SPAGHETTI WESTERN: BRAT Productions will also perform a sneak peek at their newest production, The Last Plot in Revenge, described as a western melodrama told in spaghetti and song, influenced by the works of Tom Waits and Bertolt Brecht. FAB PRIZES: The live auction closes and the winners are revealed. Will you be that lucky person to win the basket overflowing with tickets? There is only one way to find out. Join us on April 19 from 5-8 and learn just what it means to Party Like a Poet! Quincy Scott Jones earned his Master’s Degree at Temple University and was a lively participant in the Philadelphia poetry scene for over a decade. He is known as a passionate poet, collaborator, and teacher. He has founded reading series and performance groups and currently teaches in the English undergraduate and MFA programs at Arcadia University. Quincy lives in New York City and is the author of The T-Bone Series, published by Whirlwind Press in 2009. Find him at quincyscottjones.com. BD: I know you spent some childhood time in New Jersey, and lived in Philadelphia for awhile, and now you’re in New York. Tell me about your history a bit. QSJ: Well, I spent some time in Jersey and Philly. I went to Providence for my undergraduate degree. I was at Temple for grad school starting in about 2001, and go to work on avant garde stuff. Experimental poetics. I had a couple of great profs, especially William Van Wert and Jenna Osmond. BD: So how have all of these places influenced your work? QSJ: Well, place always figures into my work. Now that I’m in New York, I can kind of look back on my time in Philly and start to see it as a whole. Yeah, place always kind of influences you in different directions. BD: That’s interesting, that you say it’s when you’re outside of it, you start to process it and write about it. You seem to have spent most of your time on the East Coast. Where were you when you were in Providence? QSJ: I still think it was a clerical error, but I’ll take it. QSJ: That’s what I really love about Philly, is that, as a starving artist, it’s really where you need to be. It’s very supportive, it’s got a diversity of voices. BD: How does NYC compare for you, then? Do you have people you’re starting to work with up there? QSJ: We do, mostly through my wife Mina. I do find it’s a matter of pros and cons, and I’ve only been here for a couple months, and those first few months were freezing cold so I wasn’t going anywhere. You know, I do love the energy in New York, and that’s one thing I find missing in Philadelphia sometimes – that kind of drive. In New York you’ve got Wall Street, and the art scene, and you can do Def Jam or Sing Sing. Even with poetry there’s the sense of, “Oh, you can do something with this art.” But at the same time it breeds a certain amount of competition. And that’s why I’m so glad I spent my early years in Philadelphia. It was support. And now that I’m wanting to do that something more, New York is great. But that competition is there – and like any art form, there’s only so many slots at the top. BD: But you’re in New York. It’s like, “I’m here now, I just gotta do it.” I love New York City, it’s wonderful and amazing. It does seem to encourage different things…there’s that innovation, you have to do something new and different and bring something people haven’t seen before. But that competition can be a double edged sword. It can get you juiced up, but it can be discouraging too. So here (in Philly) you got to build your confidence in yourself and your work, and now you can take that and run with it. QSJ: Definitely. Actually, Bill did say, “You should go to NY,” and I didn’t quite follow his advice. I think that at 23, I would have been eaten alive. I could have gone maybe when I was 26, but I’m glad I didn’t go at 23, I needed to build that confidence and be able to make mistakes. BD: Yeah, New York doesn’t seem to have room for making mistakes. QSJ: No, I know people who were here at 23 and they did fine…but for me, I needed to be in Philly and connect with artists and communities of artists, and try out new things. Then reflecting I was like, wow it’s been a decade…and those early attempts, some of those early attempts were pretty bad, you know. Some of that group work could be pretty bad. BD: Well, let’s talk about one of those collaborations. Adam mentioned you guys were in a group together called Arsenic Pizza. Tell me a little bit about Arsenic Pizza. QSJ: I think the best accomplishment was the name (laughs.) Arsenic Pizza was a performance group. For many years I taught Page and Stage, which is a poetry performance class, with full disclosure that I’m not the best performer in the world. I remember one year really missing it, really being envious of my students. And I got together with some performers and we said, oh we should do this. At the time Tamara Oakman was there, and she wanted to do some performance work, and she knew Adam, and a former student of mine, Daniel Shaw or Dan the Man Shaw. And we were all itching to do some performing. The joke was, we had four completely different styles of writing. And we just spent time…we did it two summers in a row. And we spent the whole summer fighting, then put a show together at the end. BD: And you guys performed at the Fringe Festival. QSJ: (laughs) Yes, we did it again. BD: Well, it’s interesting because poetry has this, it’s meant to be spoken, it’s meant to be heard. But it’s also so intimate between the author and the words. When I saw you perform I was so impressed, especially as someone who struggles with reading my work. I have a hard time feeling like I’m engaging the audience with that work. And I also feel many times, when I go to poetry readings I have a hard time staying engaged sometimes. You know, I’ll listen to the first poem and I’ll start to think about that…then I miss the next three poems and I feel like I haven’t given the author their due. But when I saw you read, I was there with you the whole time. So I guess my question is, what is your relationship with words spoken versus the words written. QSJ: There’s a slight difference. Because there’s the sense that poetry should be reflective, that it should wash over you. You know there’s the joke that a good haiku should be read twice, because you get it once and then you have to let it wash over you again. In that way, it’s hard to perform poetry, because you don’t have time to let it wash over you, to reflect. But this is something that Temple taught me, that it’s a performance, and every poem is a performance on the page. And at a reading it’s an attempt to translate that performance. But I think there’s also a sense that, reading work, even very serious work…everyone has their day jobs. I don’t know any professional poets. Well, maybe Sonia Sanchez. QSJ: But that’s what you do, and there should be a sense of enjoyment in what you do. And you should enjoy the reading of it, even if the subject matter isn’t something you enjoy. And you have to remember that most everyone who’s going to the reading is there because they enjoy poetry. So let’s sit back and enjoy it. The really great poems…I used to teach this in my class…the really great poems are the ones you hear it and you’re excited by it, and that’s level one, maybe level two of the poem. Then level three four, five…twenty, is the reading and getting into the poem, and that’s always a solitary act. QSJ: And that’s why I started that class. You know, the more traditional, academic poetry doesn’t always work well when read, and that’s when even for people who love poetry, sometimes feel like they have to just sit through it. And that needs work on it. But at the same time…I started to teach this class in 2006 or so, when the spoken word thing started to drop off, and it became very much to be just about the performance itself. And you’d hear it once, it would be amazing, then you’d hear it again, and not so much. No, a poem should be something you enjoy over and over again. So how can we find a balance between the two? BD: Right, because you weren’t going to go back and read those poems and get any more out of them. QSJ: It’s the same thing. You go to the art museum, and you see something that strikes you the first time. And the next time you go you just pass…and finally one day you sit down and really look at it. And a poem has to strike the same way, then you can go back and look at it again. BD: Well that brings me to T-Bone. Where did T-Bone start? Where did he originate? QSJ: Well, T-Bone was officially born as a side character in another poem. I wrote it as an undergraduate, more worried about my social life than my grades. And he kind of carried through to other poems. Actually, it was a response poem. In grad school I met this guy, named Rick Foley, an interesting guy to hang out with in your early twenties. And he wrote this kind of back-handed compliment poem about me, and he read it in class. And it was about the Saturday night life, as opposed to the Monday through Wednesday life. And I wrote this response poem, and it just kept going. And in many ways I think, in academia…you’re in grad school, and it’s so intense as opposed to undergrad. They’re trying to put this craft in you. And it’s somewhat intense and somewhat isolating. And you go to this little room, and you have this experience with the poetry, and you think of all these multisyllabic words, and you get heavy into theory, and you come out of the elevator and you’re in North Philly. QSJ: And it’s this huge contrast. And so you have this theory, and here’s what’s going on in real life. And it’s not even real life, because real North Philly starts a bit later, and every year they push it out even further. And I started writing T-Bone as that contrast. BD: That’s right, as you brought up, you can deal with serious things in poetry. And T-Bone deals with some pretty serious things, some real heavy hitters come his way. But I see a lightness there too, and perhaps it’s the way you deal with…you employ a lot of rhyme, you keep it moving…it has a lilt to it, so even when he’s meeting the Grim Reaper there’s still a sense of humor to it. I don’t know if that’s something you were going for. QSJ: Oh, well, one of my favorite poetic influences was Richard Pryor, who can talk. He most famously wrote a bit about lighting himself on fire while smoking crack. It’s the funniest thing, but none of the tragedy of drug abuse, or the suicide attempt it was based off of, is lost. But it’s funny, you can watch it again and again. BD: So T-Bone and Quincy Scott Jones don’t overlap necessarily. QSJ: God, I hope not. No. BD: In a lot of my poetry, it’s hard to see how the narrator is different from me. Would you say the distance between you and T-Bone gives you some freedom to approach some of the difficult things without that internal censor coming and saying, “No, you can’t write about that, people don’t want to hear about that”? QSJ: Right, the flag. So that’s still going to be a part of it no matter what. It’s still a pleasure. You look at Robert Hayden and see where the abuse came in, and where some of the good stuff came in. It’s all there, beneath the surface. BD: Because you still have to deal with your own stuff. BD: So, what are your plans for National Poetry Month in April? QSJ: (laughs) Well, this is it. You know, like Black History Month, you always want to have more than just a month carved out. In May I’ll be back in Philly, doing a reading at Musehouse. BD: Great, well thank you so much for speaking with me. I’ll definitely check you out in May! QSJ: Thank you, and good luck with the book. After reading Michelle Hartman’s new poetry collection, readers will not feel disenchanted or disgruntled. The poetry collection, split in three sections, takes a reader on a journey through an education of storytelling starting with “Fairytales” moving on to “Myths” and ending with, “Reality.” Hartman’s ability see and write things the reader either refuses to see or has glossed over gives her poetry a one-two punch which makes her poetry stay with the reader. &nbsp; In the first section, “Fairytales,” Hartman seems to channel Anne Sexton’s collection of reimagined fairytales called, “Transformations.” Hartman looks at the underside of fairytales. At times, Hartman looks at the secondary character most readers may not remember from their childhood. In the poem, “Grandmother got game”(p13) the reader meets the grandmother from the Red Riding Hood tale. In Hartman’s vision, this grandmother gets plastic surgery and gets rid of her, “…flour-sack dress”(line 2, p13). In the poem, “By the way” readers are once again treated to a visit from the wolf. It seems Grandmother could not resist the seduction of the wolf. Another poem, “The fallout of fairytales” looks at what happens to the dwarfs after they fed, clothed, and cared for Snow White and she runs away with someone else. The second section, “Myths,” the reader is introduced to Hartman’s interpretation of what makes myths. The poem, “Used People” (p.40) is a glimpse into the world of the used bookstore shopper. When the shopper picks up a photograph found inside a book on the self, the narrator tries to invent lives of the people in the photo. The shopper walks out of the store with no books, but a photo. In the poem, “She prays for road kill” (p.64) the narrator prays for the soul of the dead animal found on the road and mixes religions, “just in case” (line 13 p. 64). The last section, “Reality” is a brutal look at what most people do not want to see. The poems on writing are very appealing because this is a world many take for granted and writers only understand what takes place in this world. The poem, “Workshop” (p. 74) takes the reader into the world of a person work shopping his or her poem. All the typical work shop attendants are there and they all rip the poem apart until two lines of the original piece remain. On page 115, readers meet the poem, “Some Assembly Required” which promises the buyer a “guaranteed poet laureate/in every box”(lines 7-8). Michelle Hartman’s new collection, “Disenchanted and Disgruntled” is a great mix of the familiar and the outrageous. Hartman’s poems punch a reader in a gut and a few days later, the reader will still feel the aftershock of her vision of the world a poet lives in. Saturday, April 20, 10:00 a.m. until 4:00 p.m.
Register in advance for free workshops. Poets of the Virginia Center for the Creative Arts: Ned Balbo, Barbara Crooker, Kenneth Hart, Teresa Leo, Neil Shepard, Taije Silverman, J. C. Todd, and G. C. Waldrep with anthology co-editor, Andrea Carter Brown. Upton’s second topic of boredom can also be a cause of panic. The fear of boredom, and of being boring pushes us to work and guides us to avoid those who bore us. This sapping of life is a fearsome thing because it is a physical reaction felt as an unquenched restlessness. Upton says, “A writer must rinse out the trough of expectation and turn boring moments into functional ones.” (55) She remembers her mother enlivening dull conversations by saying “I once saw a man completely covered in warts.” (60) Upton guards against any possible boredom in her writing by punctuating her barrages of citations and good sense with the same kind of sudden humor. Her chapter titles are full of wit and there’s even a riddle buried in the book. Upton speaks of M.F.K. Fisher whose writing is sensuous, direct, and replenishing. She cites Fisher’s ability to “bring her obsessions with food into literature—to make food into a narrative, and to make narrative into something like food.” (75) And she hadn’t even been born French. (76) Ordinariness can be replenishing. Upton slips into examples of purity from history, culture, and literature. We want to avoid writing “pure poetry” although she admits to trying to purify her poems in the past. There is an unheralded section between Purity and Secrecy titled Bigamy for Beginners that deals with cross-genre writing. “…writing across the major genres can be a sign that a writing life may require more apertures, more outlets, and that for some writers the most fruitful ambition can best be realized on multiple fronts…” (101) When a poet writes prose she leaves behind compression and engages in a slower unfolding of a vision. In the last section on Secrecy Upton says, “We probably never entirely grow out of burying and unburying what’s valuable…” (119) “Literature is the province of the secret…” (121) “So much of life is a secret that wants to be expressed and can only be approximated.” (123) We keep trying through panic, boredom, misplaced ambitions, and the struggles Upton acknowledges along with us.